On August 25, Xiaomi has cooperated with China Mobile to release a new phone, Redmi note 4 smartphone, which is the new edition of Xiaomi Redmi Note 3. So which is the better one? And which one is more worthwile to have a try? 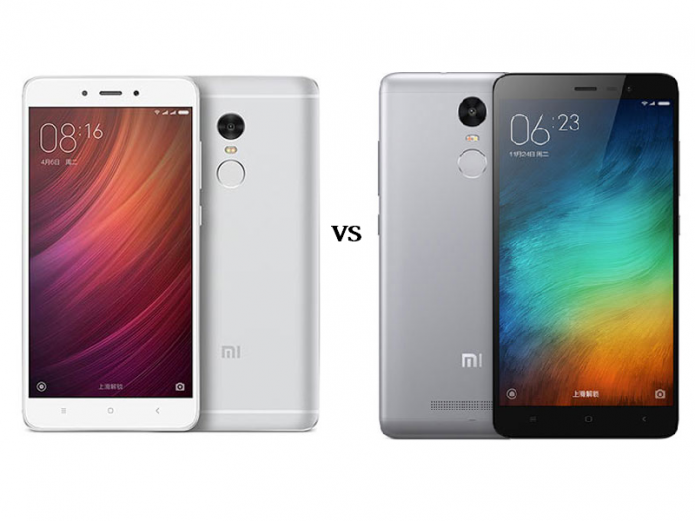 Let’s check what are main difference between Redmi Note 4 and Redmi Note 3. According to hardware comparison, we can see this Redmi Note 4 has upgraded the processor, so the performance will have improvement, we will let you know by Antutu test, besides CPU, there are no big difference , even the price. In addition, the storage, battery, network, body color, and other features are also similar. So it’s very hard to see the difference from their specs, Redmi Note 4 and Redmi Note 3. In terms of design, Redmi Note 3 is the first one to use all metal body, due to the first one, the design will be not so ripe, first, the front design comes with 2.5D curved glass, there is no symmetrical design on the screen, the bottom still uses traditional three virtual buttons. Redmi Note 3 has nice back design to use classic three step metal back cover with sand metallic plastic up and down, the middle part shows the metal material, and the back uses curved processing with good grip feeling. So the back design is good. About Xiaomi Redmi note 4, it has been designed more ripe based on Redmi Note 3, first it is equipped with 2.5D curved glass, and thinner frame, there is symmetrical design on the screen in addition, the bottom will still use three traditional virtual button. In terms of front design, Redmi Note 4 and Redmi note 3 have two details about change. On the back, Redmi note 4 doesn’t use three step metal design but all metal back cover, it uses 9 Series CNC diamond cutting similar to Redmi Pro, and the body design uses in symmetry. The holding feel and visual are more excellent, which can be one of the best budget phone under 200usd. Therefore, Redmi Note 4 has obvious upgrading in design compared with Redmi Note 3, the front design uses 2.5D curved glass, symmetrical design, the back is equipped with CNC diamond cutting all metal back cover with better quality and more beautiful design. So Redmi Note 4 looks better than Redmi note 3. Redmi Note 3 has two versions according to processor, Helio X10 version and Snapdragon 650 version, Redmi Note 4 has standard version and advanced version, both are powered by Helio X20 Deca core processor. Therefore, according to antutu test, Redmi Note 4 performance is better than Redmi Note 3 obviously. As for network, Redmi note 4 supports Netcom, Dual SIM card, dual standby and 4G VoLTE, but Redmi Note 3 only has Snapdragon 650 version to support netcom, Helio X10 version only supports TD and FDD 4G LTE, so in terms of network, Redmi Note 4 also has upgraded a little. In battery, Redmi Note 4 and Redmi Note 3 are both built in 4,100mAh battery, both smartphones don’t support quick charge, they can support at least one day use. In price, Redmi Note 4 is similar to Note 3 at 899 yuan, $150. In addition, they are also similar in other features such as all metal body, fingerprint scanner, but no USB Type C port. According to overall comparison, Redmi Note 4 has upgraded in design and performance compared with Redmi Note 3, and they sell at same price, so we highly recommend you buying Redmi Note 4 now.